UK: French floating platform designer Ideol and marine renewables firm Atlantis Energy have signed a memorandum of understanding (MoU) to investigate the potential in developing 1.5GW of floating wind capacity in the UK. The partnership is planning to develop 1.5GW of floating offshore wind projects in the UK, with an initial 100MW online by 2021. "Under the MoU, Atlantis will lead the review, selection and consenting of UK sites and in attracting third-party funding. Ideol will design the technical concepts and be the exclusive provider for the floating foundation systems," Atlantis said in a statement. The partnership was announed at a floating wind conference organised by Norwegian Energy Partners and the Norwegian Wind Energy Association in Oslo. Atlantis Energy is part of the Atlantis Resources group, the tidal power developer behind the MeyGen project in Scotland. "This MoU is a significant step in our diversification strategy and leverages our existing skill set accumulated during the progression of our tidal portfolio. To now be seeking to develop a large floating offshore wind project alongside the UK's largest tidal stream project is truly exciting," said Atlantis group CEO Tim Cornelius. 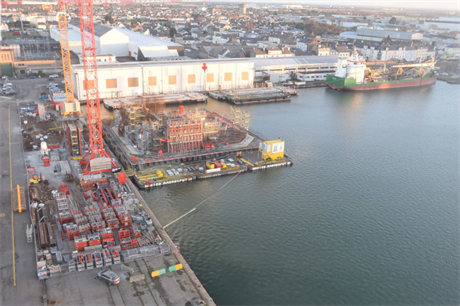 Ideol is currently building its platform for the 2MW Floatgen demonstrator project planned for a site off the west of France. Ideol has also been selected in partnership with Quadran to build a pilot floating project, consisting of four turbines, at Le Gruissan in the Mediterranean Sea, and is preparing two demonstrators in Japan. "We are very excited by our partnership with an ambitious organisation such as Atlantis which has demonstrated its unique ability to develop innovative projects and to catalyse financing from strategic investors, in particular in a key market for Ideol such as the UK," said Ideol CEO Paul de la Gueriviere.